My heart grieves when I see the disunity in our nation and terrorism throughout the world. The murders within our own city are shocking. Problems in our church members’ homes touch me deeply. Where can we find peace? This Sunday I’m preaching on, “Find Peace in a Troubled World through God’s Word” from John 14:21-27. The Beloved Apostle gives us the incredible words of Jesus in the Upper Room where he had Passover with his disciples. The Savior teaches us how to have peace that transcends the problems of life in a fallen world. Please join us Sunday and enter God’s peace with us. Vacation Bible School has been fantastic this week! I’m teaching adults at 5:50 in Suite A. You’re free to come the rest of this week, because each class stands on its own. I marvel at the time, effort and creativity that our workers put into our VBS. Thank you to all who have helped. I was most encouraged to see a good youth group. May our Youth Department grow for God’s glory! Come hear our kids sing a VBS song in worship this Sunday. 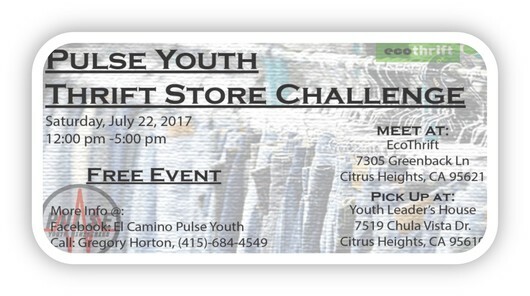 We will meet at Ecothrift Citrus Heights. Everyone's name will be place in a hat and redistributed where each person has a different person's name. $10 and one and one half hours later, each person leaves with an outfit that someone else chose for them. Our next stop, the youth leader's house to watch a movie. Anyone who has made a decision to join El Camino Baptist Church, anyone who is a new to the Christian faith and anyone who want to know more about what it means to become a church member, join us in the Conference Room at 9 am during Bible Study. $10 per person for bowling and pizza. Bring your picnic basket and join together with family and friends for some great fellowship. Join Arden-Arcade churches for an evening of Worship. El Camino Baptist Church was given the COMMUNITY AWARD in the 4th of July parade. Thanks to all who helped! Thank you to everyone who came out this past Saturday for our work day. We had so much going on from cleaning the bounce house, cleaning bathrooms, organizing storage, diagnosing our lovely A/C units, switching out light fixture covers, and making VBS decorations. Each Sunday our children participate with us in worship celebration and are dismissed to Children's Church for a time of Bible learning fun and activities designed especially for them. Our 2016 Fall Festival was a success. Over all we had around 105 visitors and 50 volunteers helping with this event. We can say with confidence that everyone had a lot of fun playing games,winning prizes and enjoying the food. Our Fall Festival 2017 is in the planning stage. More information will be forthcoming. We are here to help you find a place to grow and serve! ► I'M READY TO SERVE!